I have lots of little EPP's set and ready to go today......my husband will be getting his surgery on his broken ankle today, and I have my waiting room busy work all ready......he has been waiting 2 weeks for the swelling to go down enough to have the procedure. I am off form work this week and will be able to nurse him, well, sew a lot and check up on him occasionally. I love him to distraction but he is a bad patient. 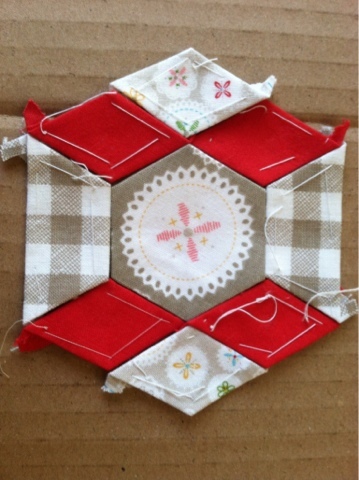 Working on my Hexie quilt and my postage block swap, due out this week. I made my original commitment of 10 but have several more almost done. 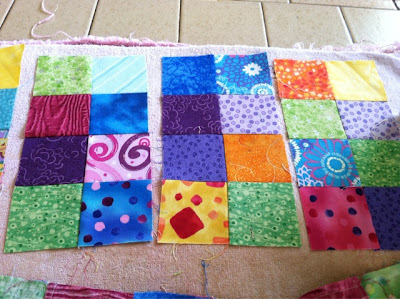 I find I really enjoy this easy block and its great challenge to match up the intersections perfectly. If not, I am OCD and have to rip and resew.